Mobile, social and geographic location continues to feed off the 80% of the global population carrying mobile devices generating more sales through mobile Web sites. Smartphone adoption grew 50% during each of the past two years. About 58% of mobile users will have a smartphone by 2015, up from 38% in 2011, and 18% in 2009, according to eMarketer. The other part of the story points to the quick rise in ownership among recent mobile phone buyers. Marketers from various companies, such as Disney and AT&T, in attendance at an eMarketer event, were updated on the sector's progress. For instance, they heard Apple increased its share of U.S. mobile phone sales to 10% in February 2011, up from 8% in the year-ago month, and Android rose to 27%, up from 7%, respectively. In addition, U.S. mobile commerce sales are predicted to reach $4.9 billion this year, and will account for $163 billion in sales worldwide by 2015, according to ABI Research. Depending on how Google's acquisition of Motorola Mobility plays out will determine who gains and retains future leads, said Noah Elkin, eMarketer principal analyst at the event. 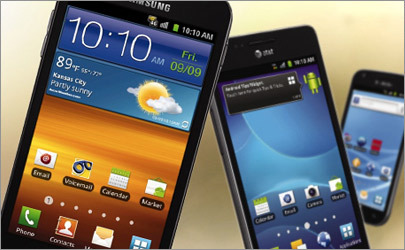 "The phone's operating system has become a key purchase factor when consumers decide on the phone to buy," Elkin noted, pointing to comScore February 2011 stats suggesting OS is the No. 1 factor, followed by app selection and music and video capabilities. "The fact phones can make voice calls continues to become increasingly irrelevant." It turns out that mobile Internet traffic worldwide rose to 5.02% in June 2011, up from 1.82% in March 2010, according to Net Marketshare. While it may not seem like much, the percentage doubled in the past year. Sales on Guitar Center's mobile Web site doubled in the past six months. It generates between 3.5% and 5% of online sales, Kirit Sarvaiya, Guitar Center director of multichannel marketing, told MediaPost. The company began launching mobile services last year, but sales started kicking in six months ago. One of those services, Location Finder, supports location-based services through HTML5. Guitar Center has more than 220 stores across the country. Each has their own microsite. Consumers who are willing to purchase online get specials not available in stores. Within two weeks, each store will have an option to run location-based coupon campaigns. The strategy aims to make the shopping experience local and social. Search engine optimization became a priority as Web site traffic on desktops and mobile rose. About 80% of Web site visitors come from search and links on social sites and blogs, Sarvaiya said. "We spend about several million dollars annually on digital advertising, but there's a point when you spend too much," he said. "That's when conversion rates decline. You know it's too much if conversion rated don’t improve even with increased spend." Those who caught eBay's earning's results earlier this week know eBay Mobile GMV expects to reach nearly $5 billion in revenue for 2011, more than double from last year. The company's mobile apps have been downloaded more than 50 million times. Today, consumers make three purchases per second on eBay Mobile applications. Elkin said all mobile commerce is not yet local, and all local commerce is not yet mobile, but the industry continues to move in a direction where the two will converge. Consumers will do this, in part, through electronic payment services that also provide loyalty services, such as Google Wallet. "Google isn't taking a share of the election transaction, but looking instead at the connection between online and offline, and driving Web traffic into stores," he said. 1 comment about " Mobile eCommerce Gains Consumer Buy-In". Sonu Parashar from Doon Intractive Solution Pvt Ltd., October 21, 2011 at 7:19 a.m.
Making a mobile version website is not necessarily are more expensive, instead it is actually the miniature version of the existing desktop version of your website with less content and even lesser and simple designs. There are certain guidelines and key factors that are required to be kept in mind while creating your mobile version of website.